You’re walking on the sidewalk and you come across a patch of ice. You don’t see it coming, so you lose your balance and fall hard on the ground with your elbow bearing the brunt of the impact. Although you get right back up, a tremendous bleeding scrape on your elbow remains – an unwanted “souvenir” from the dastardly ice patch. With, some quick first-aid, you patch the wound to prevent infection, and about two to three weeks later you forget about the scrape as it resolves itself. A puzzling question from this common scenario is how does this wound (or any wound for that matter) heal? The answer is that it involves a complex process that is not completely understood. This process coordinates numerous types of cells (originating from various locations in the body) to affect the healing response. In this article we’ll delve a little deeper into what’s known about this amazing process, focusing specifically on skin and how the immune system is involved in wound sterilization and tissue repair. When your elbow hit the ground, the mechanical stress from impact damaged your two primary layers of skin, the epidermis and the dermis, and disrupted the underlying blood vessels – causing you to bleed. How did your body take care of the wound so effectively? There are four phases of wound healing: the 1) hemostasis 2) inflammation 3) proliferation and 4) remodeling phases. In the first phase, platelets – blood cells that are critical in forming clots – aggregate at the damaged site and initiate clot formation to prevent blood loss and create a temporary covering that provides protection from the external environment. This covering is commonly referred to as a scab. While the platelets aggregate together, they also secrete factors that recruit other immune cells, and these factors initiate the inflammatory phase. The redness and swelling that follow the hemostasis phase occur as a result of the dilation of local blood vessels to allow immune cells to enter the damaged site. The first responders are cells known as neutrophils and these remove foreign material and bacteria from the wound. The next wave of immune cells to arrive at the scene includes monocytes. These cells normally reside within the spleen and bone marrow, and can be mobilized in response to injury or infection. Once in the wound, these cells can differentiate into cells called macrophages, which coordinate the wound healing response. Macrophages can be thought of as the immune system’s “construction workers.” They clear the damaged site of debris in order to lay the foundations for tissue repair. These cells were originally described as their name suggests as “big eaters” (macro = big, phage = eat). They use their “eating” capacity in order to clean the site before repair occurs. This lays the groundwork for the proliferative phase where macrophages resolve the inflammatory phase and shift towards tissue repair. In the proliferative phase, these “repair” macrophages help promote the reconstruction of the tissue’s extracellular matrix, a biological scaffolding for the cells that will form new tissue, by producing fibroblast growth factor. Fibroblast growth factor promotes the growth of cells called fibroblasts that then repair the extracellular matrix. Fibroblasts produce the precursor components of the extracellular matrix that, when assembled, will provide structure to the tissue. This matrix is temporary and is replaced by a stronger matrix in the remodeling phase. Once this matrix is repaired, macrophages can promote the growth of skin cells that fill the previously wounded area. Fibroblasts within this site also differentiate into myofibroblasts that resemble muscle cells. These myofibroblasts close the wound by contracting similarly to how muscles contract. This results in permanent closure of the wound, preventing exposure to the external environment. New blood vessel formation, if the wound is deep enough to disrupt the vasculature, is also guided by macrophages in a process called angiogenesis. Macrophages secrete proteins like Transforming Growth Factor b1 (TGF-b1) and Vascular Endothelial Growth Factor (VEGF) to recruit the cells that form blood vessels, and then pattern their growth . The last phase of healing is tissue remodeling, which can persist for weeks to months. In this phase, macrophages in the site gradually die, or migrate away, and the extracellular matrix is remodeled for long-term use. Although the wound is closed at this point, the tissue is not completely back to normal. The extracellular matrix hastily laid down by fibroblasts in the proliferative phase is not meant to be permanent. Its production, and the swift wound-closure that accompanied it, are simply stopgap measures to prevent blood loss and infection. The remodeling of the extracellular matrix in this phase functions to provide additional tensile strength to the new skin and to augment its barrier properties. In most cases, expedited healing responses can be prone to forming scar tissue, which is an accumulation of fibroblasts and extracellular matrix components within the wound site. Certain medical conditions, for instance diabetes or immunosuppression, can have negative impacts on the wound healing response. In addition to high blood sugar, peripheral blood circulation is often occluded in diabetes. This reduced blood flow hinders the wound healing response likely by preventing cells such as platelets and monocytes from entering the wound. Diabetes patients with chronic wounds, usually in the form of ulcers, face a substantially higher risk of infection and infected limbs must often be amputated to prevent the spread of infection. The immune system plays a crucial role in the process of wound healing. This article only breaches the surface of what the immune system can do. There are many cellular and molecular differences between acute (normal) and chronic wounds, and many critical factors may be missing or in insufficient amounts in a chronic wound healing response. A more complete understanding of the pieces involved in the healing response will enable us to create new therapies, such as growth factor replacement or cell based healing salves, to treat chronic wounds. This will prove useful as the rates of chronic wounds will rise in relation to the diabetes epidemic our population is currently facing. With all this in mind, maybe the next time you scrape your knee or elbow you’ll have a greater appreciation for just how complex the healing process is and how important it is for maintaining health. Christopher Garris is a graduate student in the Immunology Program at Harvard Medical School. Nguyen, DT, et. al. 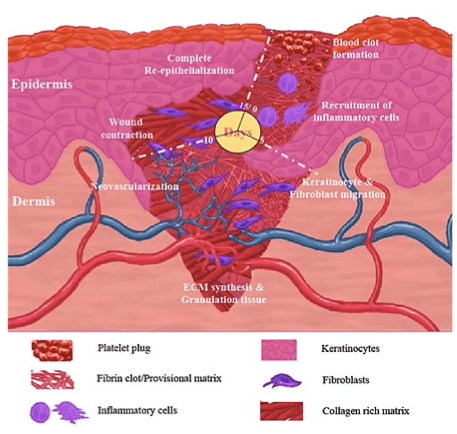 “Chapter 4: The pathophysiologic basis for wound healing and cutaneous regeneration.” Biomaterials for Treating Skin Loss. pp25-57. (2009). Delavary, DM et al. “Macrophages in Skin Injury and Repair.” Immunobiology. 216:753-762. (2011). The Biological Mechanisms Behind Injury and Inflammation: How They Can Affect Treatment Strategy, Product Performance, and Healing. This is a great article and thank you for taking the time to write it. I am particularly interested in wound healing in elderly as wounds in the lower extremities often take weeks to heal and some longer. As Nurse Practitioner I feel that prevention of wounds is the best way to manage lower extremity wounds in the aging population. This will save money to the already taxed healthcare system and also save days of pain and suffering in this population. Thank you for sharing this insightful piece with us. I am about to embark on an adventure to Vietnam where I will be lecturing medical students about nutritional management in wound healing, trauma patients and type 2 diabetes and I was curious about your opinion on these topics. I am focusing on FOOD as my healing agent and I thought you’d be a great person and resource to discuss this with. Thank you for your time in advance! Hope to hear from you! Thank you for your good articles it’s simple and clearly, I learn many things. I always used my blood clotting as an effective means for skin injuries from my childhood. Though it takes some time but skin reappears perfectly.l observed that you using detail or tincture iodine followed by dressing at hospital appeared to be coumbersom. Hence it become conventional to adopt blood clotting inspite of ressistances from the members of my family. so if you have a healing wound would your monocytes increase via Cbc blood test? I found it interesting when you talked about how cells can remove the foreign material and bacteria to help the wound heal. I just needed to know about these things because we will be taking my cousin to a doctor tomorrow. This is for his huge wound that we covered just now. He got it from hitting his leg on the edge of the stairs while running to the second floor of our house. Thank you for this article. My 18 year old daughter has had 3 wound revisions after her meniscus surgery this past October . Since then, the wounds start off closed but then reopen. The 2nd wound revision had an infection. But nonetheless, there are no medical reasons why she shouldn’t be healing. We have had bloodwork done multiple times. Her white blood cell count has been borderline high but still in the normal range. Her antibodies have also been tested but still within normal range. She also has a blood clot that she developed after this last surgery. Which now puts on a blood thinner. She has nerve issues as well as pain from the multiple surgeries. Not sure where to go from here. Searching the web as to why no doctors (we’ve been to MANY) have been able to help her or figure out why she won’t heal.